Walkonomics: What Makes the Best Route? Most smartphone map apps give you several direct routes to get from Point A to Point B, but the quickest or most convenient path isn’t always the most enjoyable. Those interested in finding the most beautiful, walkable route to their destination can now try Walkonomics. The app, created by United Kingdom programmer Adam Davies, allows users to find more beautiful paths through seven cities across the globe using both open and crowd-sourced city data. Walkonomics attempts to provide just that. 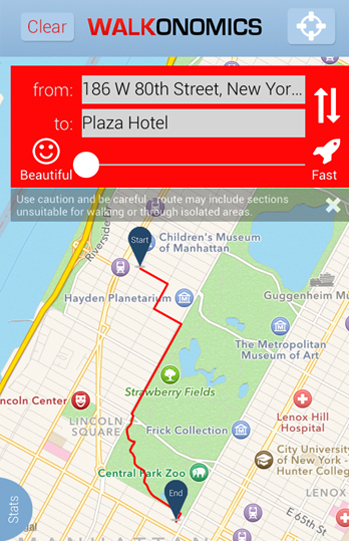 Not only does this free iOS and Android app allow people to check the pedestrian-friendliness of most streets in Central London, Paris, New York, San Francisco, Toronto, Buenos Aires, and Glasgow, but it also allows them to chose either the quickest or most beautiful routes between destinations in these cities. 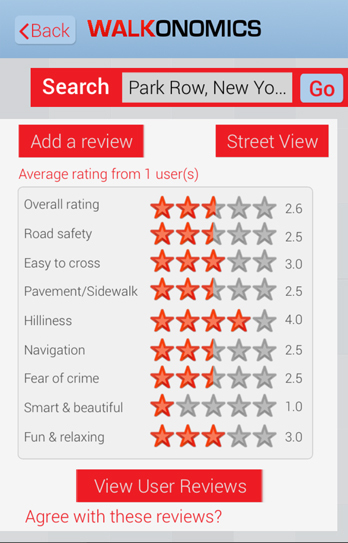 The app provides star rankings for eight different categories of pedestrian-friendliness: road safety; easy to cross; pavement/sidewalk; hilliness; navigation; fear of crime; “smart & beautiful;” and “fun & relaxing.” These ratings are generated from open data including street widths, traffic levels, crime statistics, pedestrian accidents, and even how many trees are on each street. Visitors and residents can provide additional ratings for each of these criteria as they walk down streets in their neighborhood, as well as geo-referenced photos. As I tested the app, I found that certain elements are not as user-friendly as existing ones in Google Maps. For example, typing in the name of a location rather than a specific address, which typically works pretty accurately in other mapping apps, is a bit of a struggle with Walkonomics, which requires your location or a very specific address if you’re not navigating to a famous landmark. Though I am not a native New Yorker, I also found it strange that the most beautiful route between two New York City locations took me around Central Park, while the fastest route took me almost directly through the park. Is a stroll down a tree-lined street truly more beautiful than a walk through a park? This raises the question: how does Walkonomics actually quantify the most beautiful route, when what makes something beautiful is subjective. Furthermore, it’s unclear how Walkonomics, which is intended for urban streets, incorporates parks. Perhaps, the app could benefit from more crowd-sourcing and input from people who really know these streets (Most streets in New York only have one user rating). Davies said he also has plans to provide more options, like the safest and cleanest routes, which are more easily quantified. Despite the app’s shortcomings, Davies has certainly tapped into a real demand for walkable places. Also, studies have shown that walkable streets can boost retail sales by up to 80 percent. Research indicates walkable neighborhoods reduce obesity levels, carbon emissions, and crime, among other benefits. In fact, the benefits of walkable cities have become so widely known that many big businesses are choosing to move their headquarters back to more walkable locations. If you live in one of the seven cities available on the app and have an extra five minutes in the morning, take Walkonomics for a spin. Not only could you end up feeling less stressed at the beginning of your workday, but you’ll have the opportunity to add to a growing data source designed to make cities a little bit more livable. And, hopefully, Walkonomics will in turn open up its own data, as it could be really useful to landscape architects, urban planners, and health researchers trying to figure out what makes one route more appealing than another. The ability to measure the quality of walks still is rather primitive, but it is getting better and better. I’d add “percentage of tree cover” as an additional variable. Trees are great in summer, when it’s hot, but the “fascination” element of their presence in fall and winter also improves a walk.